Choosing painting materials will depend initially on what you wish to paint. Your first choice will concern which medium you wish to painting. 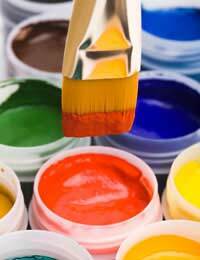 Acrylic: Acrylic is a water-soluble medium designed to act like oil paint, but with a quicker drying time. Acrylic is generally considered to be easier to use out and about as it does not rely on oils as thinners and can be removed from clothing with warm water. Acrylic can be scraped off and reworked once used. Quick drying acrylic can be easily painted over making it a faster medium to use than oil paint and avoiding a muddying of the colours that can occur with oils due to their slow drying times. Gouache: Gouache is an opaque watercolour paint, made by combining watercolour with chalk, or a similar substance. Gouache is great for graphic work and is good for using on the move. It is relatively quick drying and fairly thick, therefore good for impasto work. Oil: Oil is considered often to be the golden standard of artist’s paints. It is more versatile than other paints, has a greater luminosity, can be painted very thin or extremely thick and retains its colour for centuries if properly looked after. It is a medium that, if handled with patience, will produce outstanding effects. However, it is one difficult to master, messy and expensive – and not often the best for bold, quick and simple sketches or graphic works. Of the paints discussed here Oil is the one requiring the most specialist equipment and tends, therefore, not to be used until an artist is sure they wish to become involved in painting. Watercolour: Watercolour is a highly transparent medium easily transported and generally regarded as ideal for landscape due to the way it holds and reflects light. It requires little in the way of equipment, is inexpensive as generally undertaken on a small scale. The above is only a guideline, and paint mediums are covered in greater depth in their own section on the website. Choosing materials to go with these mediums will depend partly on budget. The main thing to remember is that the best effects will be produced with the right materials and whilst one may not wish to buy the most expensive brushes, it is best to use a watercolour brush for watercolour, an oil painting brush for oil, and so on. Some brushes are interchangeable, and a shop assistant should be able to help you to make your choice. Other materials will depend on what you wish to achieve, but essentially you will need brushes and paper suitable for your chosen material, pencils, an eraser and a sketchbook (you can buy oil sketch pads and watercolour sketch pads if needs be). Getting a balance between quality and cost is important, and everyone knows someone who has bought the entire painting kit at great cost only to leave it to gather dust. The main thing is to buy a set of good sturdy materials, made for use with your medium. Other than bought materials, rags and pieces of wood from around the home can be utilised (for cleaning and for painting upon. An artist’s kit must be practical and anything that can be of use may be added.